Ray Schrump was born in 1932 in Tomahawk, Wisconsin. He enlisted in the U.S. Army on May 10, 1949, and served in combat during the Korean War before receiving a commission as a 2d Lt of Infantry in the U.S. Army on April 18, 1958. 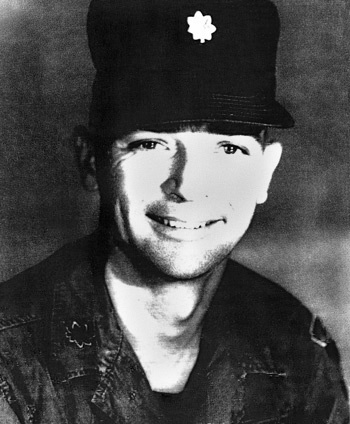 After completing Airborne and Ranger Schools, Lt Schrump served with the U.S. Army Training Center at Fort Jackson, South Carolina, from August 1958 to September 1959. His next assignment was with 1st Brigade, 7th Cavalry in South Korea from September 1959 to November 1960, followed by service with the U.S. Army Infantry School at Fort Benning, Georgia, from December 1960 to October 1962. 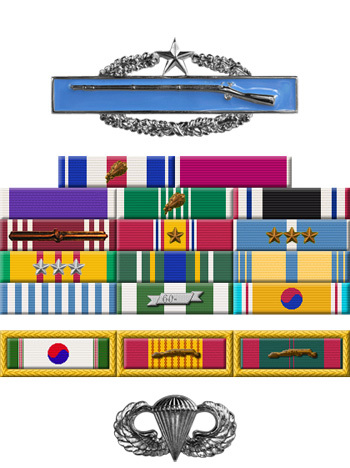 After additional training, Capt Schrump served with Company A, 7th Special Forces Group at Fort Bragg, North Carolina, from March to June 1963, and then with Company A, 6th Special Forces Group at Fort Bragg from July 1963 to December 1964. His next assignment was with Headquarters 3rd Special Forces Group at Fort Bragg from December 1964 to December 1965, followed by Cambodian Language School from January to December 1966. Maj Schrump next served with the 1st Special Forces Group in Japan from January to October 1967, and then completed additional training in the United States before deploying to Southeast Asia in December 1967. He served with the U.S. Military Assistance Command in South Vietnam from January 1968 until he was captured and taken as a Prisoner of War on May 23, 1968. After spending 1,727 days in captivity, Maj Schrump was released during Operation Homecoming on February 12, 1973. He was briefly hospitalized to recover from his injuries, and retired from the Army on December 1, 1973.